We can book for you a limousine service from the airport at a cost of 45 € up to 4 people. For reservation, please fill out the request form by providing the name of the airport, the flight number and the exact arrival time and a mobile phone number on which to contact us if you find problems on arrival. From Ciampino you can take the bus of the company Schiaffini that will take you directly to Tiburtina. The ticket price is 3.9 €. From Fiumicino, take the train from the train station inside the airport in about 45 minutes will take you to the Tiburtina station. Alternatively, you can also take the Leonardo Express, a train that will take you in 20 minutes directly to Termini, but has a higher cost and you still have to take the metro from Termini to reach us. Once at Termini Station take the Metro B (blue line) and stop at Piazza Bologna, From Piazza Bologna take Viale delle Provincie and go down for about 400 meters, pass Piazza of Privovicie and take the first left (Via Campaldino). As an alternative to the Terms BUS 310 for 7 stops (10 minutes) and get off at Piazza delle Province. From Piazza delle Provincie, taking Viale delle Provicie, via Campaldino is the first street on the left (about 100m). For deluxe and economy have to get off the metro station "Tiburtina". Via Lorenzo il Magnifico 158 will be just off the meter. Arriving at the Tiburtina station you can reach on foot along Via Guido Mazzoni, than Via Arduino, take Via della Lega Lombarda and turn left at the last street before the square (around 400m). Alternatively you can take the Bus 490 for 4 stops and get off at Piazza Provicie.Per of the deluxe and economy once you have arrived at Tiburtina. From the A1 take the exit Roma Nord to the GRA. Follow the signs direction Salaria GRA. Exit after about 1km exit Salaria - Parioli center center (EXIT 5). Continue on Via Salaria for about 6km, passed under the bridge of the ring road turn right towards Tiburtina Station. Follow the ring road for about 4.2 miles and exit at Tiburtina station. Continue straight on Via Theodoric (200m) and then again on Via Arduino (200m) to Via della Lega Lombarda. Turn left at Via Campaldino (last street before the main square, Piazza of Provicie). Coming from the South reach the ring road and follow the directions for Rome-Aquila. Exit at ROME-EAST BYPASS. Continue for approximately 7 km until the ring road. At the end of the road, in front of the Verano, turn right towards Tiburtina. Exit at Tiburtina station. Follow straight on Via della Lega Lombarda. Turn left at Via Campaldino (last street before the main square, Piazza of Provicie). 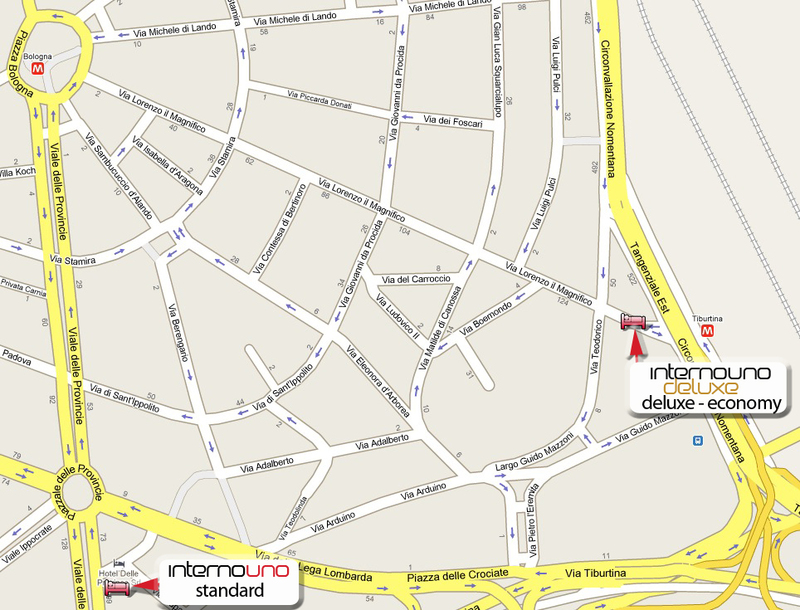 Download map to reach us from metro station!